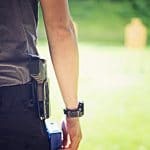 More people than ever before are legally carrying concealed firearms and while inside the waistband carry is the most popular option for concealed carry now there are other options with some going back to basics with carry options more common in the 80’s and 90’s such as belly band and ankle carry. 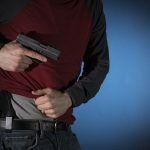 Why Use a Belly Band Holster? Belly band holsters aren’t particularly popular but they are great for certain applications, perhaps a trip to the gym or grocery store wearing sweatpants that might be too loose to attach a holster to the waistband and wear it on your hip or on a day when you might want to wear shorts and not be able to wear an ankle holster. This is where the belly band shines. Even when your clothing can’t fully support the weight of the gun you can still be armed with a compact or full-size firearm. 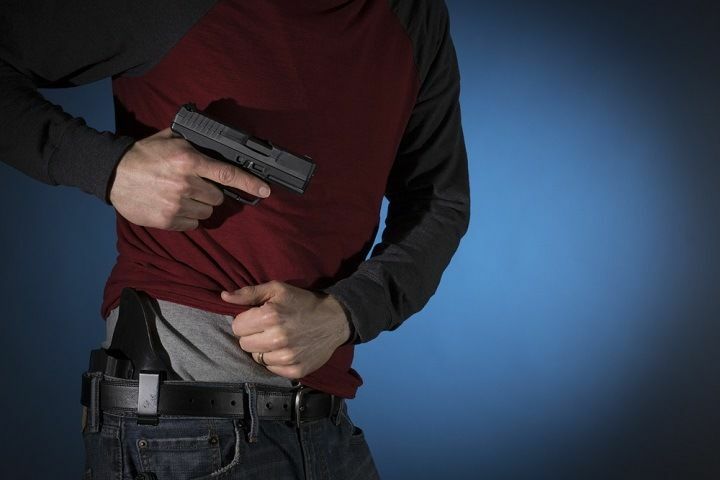 Many times, you can conceal a larger gun with a belly band holster then you can an inside the waistband holster, depending on where you position the gun on your torso. When shopping for belly band holster make sure you get a decent product that you can give this method a fair try. Here are the five best on the market and how to decide which one is best for you. Most belly band holsters are gimmicky important pieces of equipment that don’t last long. This highly reviewed model is well-liked by people who carry their guns every day because it will last a long time and incorporates simple features that make this holster easy to live with. Belly band holsters tend to get a bad name because there are many examples on the market that are low quality. This holster is specifically designed for small guns and is a great way to carry your gun even if you're wearing nothing but a T-shirt and jeans. I like these holsters for running or working out because you can wear a belly band holster that is made of high quality elastic, like this one, in an outfit with no belt. This fully ambidextrous design can be rotated to the left or right, or center to allow you to find the exact position you like to carry your gun. Similar to many ultralight and simplistic holster designs, this can be used in almost any of the same positions you would carry your gun around your belt, it’s just around your belly. One of the great things about this holster is that you can strap it on and conceal it under virtually any clothing. The lightweight and low-profile design lends itself well to summer carry or deep concealment with small pistols. This is a one-size-fits-all holster,adjustable for any size person and the ample Velcro holds your gun tightly. You don’t have to worry about longevity with his holster because it is specifically designed for the everyday concealed carrier in mind. It is made from high quality materials and will stand the test of time for everyday carry. This product is one of the best on the market for someone who wants an extremely comfortable holster. Most belly band holsters are known for chafing and being uncomfortable against the skin. This holster is different from all the rest because it combines neoprene, velcro, and elastic with a cotton lining that makes this holster extremely comfortable against the skin, even in hot weather. One of the innovative things about this holster are the retention loops added to the top of the belly band to help retain your pistol in its proper place. If there’s a downside to this holster it’s that the added retention loop requires a secondhand to draw your gun. However, if you are from the school thought that a quick draw is not necessary for a self-defense situation, this is an excellent feature because it will hold your gun more securely than most other holsters. Many belly holsters are used when high physical activity is expected and a retention loop is a bit of security that few other belly band holsters have. If you are looking for an innovative belly band that is the most comfortable concealed carry holster to wear no matter what the weather , this design will accommodate many firearms, it's a great option. If you’re looking for a belly band holster that carries a lot of gear and allows you to support a lot of weight, this is your best bet. 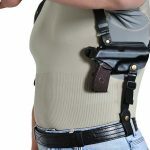 More so than any other product on the market this belly band holster will allow you to carry a lot of gear comfortably. The rugged nylon construction of this holster allows you to carry a lot of gear comfortably in the multiple pockets that are sewn into this belly band holster. 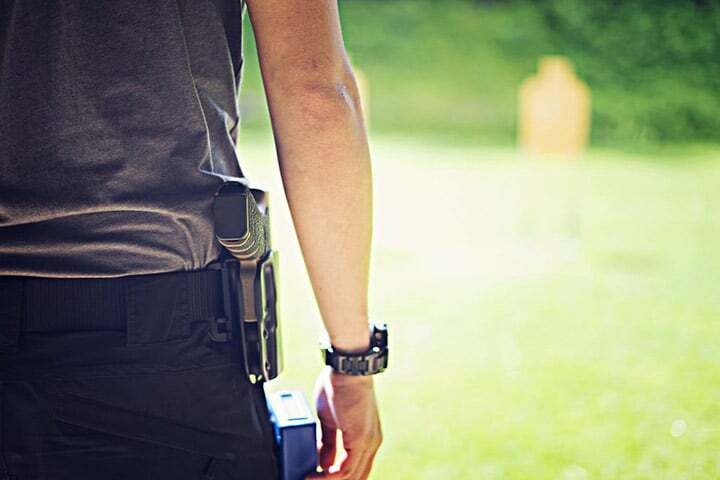 You can expect a ton of different options when it comes to what you can carry, everything from spare mags and flashlights to a checkbook or first-aid kit can be stashed inside this belly band holster. This is also one of the most rugged belly been holsters that you will come across because it is designed to carry much more weight than just a standard pistol. Even if you are planning to carry just a gun, if the gun is heavy such as a full-size 1911, this is a perfect holster option for you. The holster is neoprene lined with extra heavy-duty Velcro to make sure it stands the test of time and many people love this holster for the amount of gear that you can carry comfortably conceal. One of the nice thing about this belly band holster, and what sets it apart from others is the Velcro retention strap over the holster portion. Many belly band holsters include a thumb retention strap, but few that are disengaged by a metal clip. This means that you need a two-handed draw, but it also means that it provides faster access to your firearm than a snap or buckle. Many people who use belly band holsters use them for jogging or with an outfit where you cannot wear a gun belt. The metal clip included on this holster is very similar to what you would see on the inside of a pair of dress pants. It is extremely easy to disengage with two hands but won’t come loose while jogging or jostling around. The low-profile design and thin material of this belly band combined with the extra stretchy elastic and durable thumb strap easily make this the best holster for working out, and one of the most secure belly band holsters you can buy. Especially for the price, there’s no reason why someone who works out on a regular basis and wants to carry their guns should not consider this item. This is by far the best received belly band holster online. Loved by many shooters because of its low cost and ability to be ordered right off the shelf this belly band holster is an excellent option for someone who wants an inexpensive holster to try out. 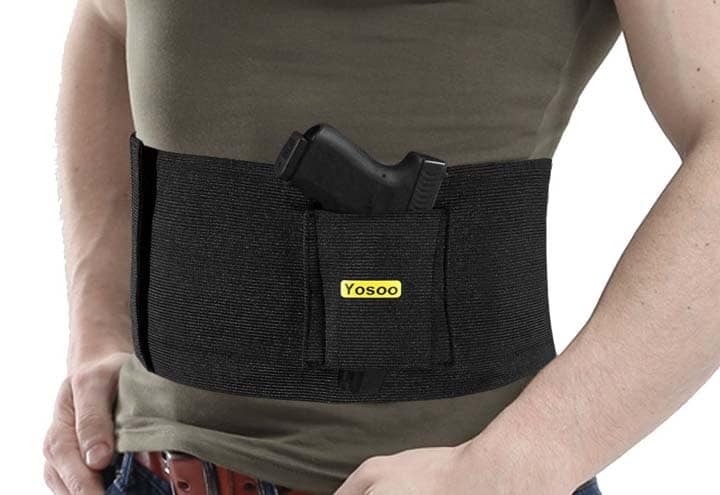 This holster is available in three sizes, unlike other belly band holsters that are strictly universal. Each size corresponds to the size of your gun, subcompact, compact and full size. The full-size version of the belly band holster is thicker to accommodate double stack and steel frame handguns and supports the weight of large guns extremely well. This holster includes a thumb snap retention feature that holds your gun in beyond just the elastic that makes up the body of the holster. An extra pocket is available for a spare magazine or a small amount of cash or other equipment. The pocket is not overly large to keep the belly band low-profile and easy to conceal an overall this is a great product for anyone looking for an inexpensive holster to try out. Preventing chafing wearing a belly band holster is going to be the number one problem you will encounter when using this method or carry. One way to do this is to wear an undershirt. This is great if you are wearing a suit and will be taking your jacket off often because you will most likely be wearing a button up shirt in addition to your undershirt and this combination will provide easy access and eliminate all chafing. However, wearing an undershirt in hot weather is not going to always be an option. The solution to this is to make sure that you get a belly band holster with a cotton lining or other soft material, and make sure that it is tight enough that it won’t move around when you move. You are more likely to get chafing from the grip of your guns than you are from the actual holster moving around and to remedy this consider using a gun that isn’t heavily stippled or changing the grip of your firearm to something that is smooth up against your skin. 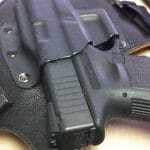 If you’re holster and gun is not comfortable to live with, you are much less likely to have it on you when you need it. If you’re looking for a simple method to carry your gun and are attracted to any of the high-speed low-profile kydex designs found on the market today, a belly band might be a good option. Shop around do some research and decide on the holster to buy. 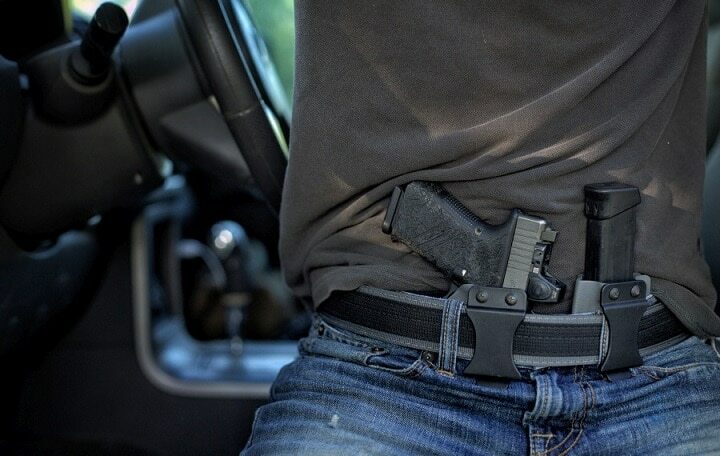 You can’t go wrong with any of the five best belly band holster listed here. The important thing is though, to carry your gun. Too many people are caught out without their pistol when they need it most and having the proper holster is going to do more to make sure you have your gun on you when it counts than anything else. Mckinley is an avid shooter & firearms instructor. He shoots, hunts and loves to spend time at the range. He has worked with and around firearms for several years and enjoys talking to anyone interested in learning more about firearms & their 2nd Amendment rights. HolsterAddict.com is a participant in the Amazon Services LLC Associates Program, an affiliate advertising program designed to provide a means for sites to earn advertising fees by advertising and linking to Amazon.com. As an Amazon Associate we earn from qualifying purchases. Amazon and the Amazon logo are trademarks of Amazon.com, Inc., or its affiliates. Additionally, HolsterAddict.com participates in various other affiliate programs, and we sometimes get a commission through purchases made through our links.